SpaceX/Flickr (public domain)The booster, or first stage, of a SpaceX Falcon 9 rocket attempting to land. Elon Musk‘s aerospace company, SpaceX, successfully launched a resupply ship for NASA to the International Space Station on Wednesday. As a cost-saving bonus, SpaceX also tried to land the 16-story-tall booster of its Falcon 9 rocket on a ground pad at Cape Canaveral, Florida . “Dragon is on its way to the International Space Station. Capture by @Space_Station crew set for early Saturday morning,” SpaceX, the rocket company founded by Elon Musk, tweeted shortly after the Falcon 9 rocket launch. But as the giant booster came screaming back to Florida with some fuel inside, a crucial system failed. The tense moment was captured during a live broadcast from SpaceX’s headquarters in Hawthorne, California. 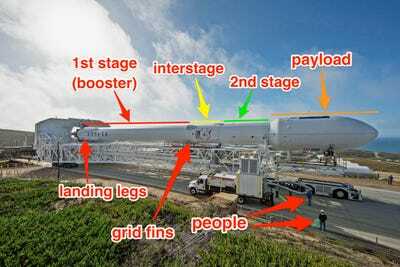 SpaceX/Flickr; Business InsiderThe main parts of SpaceX’s partly reusable Falcon 9 rocket system. About one minute before the booster was scheduled to land in Cape Canaveral – while it was travelling at several hundred miles per hour – it began to teeter and spin around and around. The sight triggered a mixture of worried “oohs” and “aahs” from SpaceX employees who were watching, then the booster’s video feed cut out from the broadcast. For a moment, it seemed as if the booster was flying out of control toward the ground. But cheers soon erupted from SpaceX employees. Musk later revealed that they were cheering the success of a backup plan: the booster “landed,” as gently as a towering object can, in the Atlantic Ocean. “Falcon landed just out to sea. Appears to be undamaged & is transmitting data. 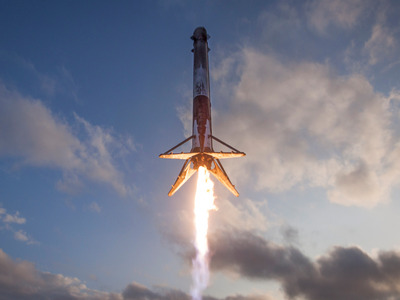 Recovery ship dispatched,” Musk tweeted. He added that the booster will likely be reused for a future “internal” mission (which likely means for the launch of SpaceX’s next-generation internet satellites, called Starlink). The footage shows the booster spinning while firing its rocket engines in an attempt to control the twirling and safely land – but with no ground in sight. It pops out its four landing legs, rockets toward the ocean’s surface, plunges in, bobs upward, and then tips over like a felled tree. Musk blamed the failure on a hydraulic pump that pushes out one of the booster’s four titanium “grid fins.” These steerable, waffle-like devices help the rocket guide itself toward a landing site while returning to Earth, then stabilise the booster during landing. As Monday’s launch of the CRS-16 mission showed, not deploying a grid fin in time can put the rocket into a tailspin, preventing it from steering toward a landing site. “Some landing systems are not redundant, as landing is considered ground safety critical, but not mission critical. Given this event, we will likely add a backup,” Musk tweeted. SpaceX wasn’t the only one to film the dramatic moment. Chris Gebhardt, the assistant managing editor of NASASpaceFlight.com, was recording the booster’s return in Cape Canaveral with several others, and he helped capture the whole event on camera. Don’t out-of-control rockets blow themselves up? Rockets that veer out of control typically self-destruct using what’s called an automated flight termination system, or AFTS. Such systems are put in place to protect people and equipment on the ground. But in this case, self-destruct criteria weren’t met, and SpaceX got to perform a soft-ocean-landing manoeuvre that it has practiced before. When SpaceX launched the CRS-16 resupply mission on Monday, it made sure the Falcon 9 rocket’s booster would hit the ocean if the landing system somehow failed. Only reigniting the booster’s engines for a precise landing burn would have pulled it off that trajectory and toward the ground pad. SpaceX/YouTubeA SpaceX Grasshopper rocket self-destructed in August 2014 after an engine sensor failure. 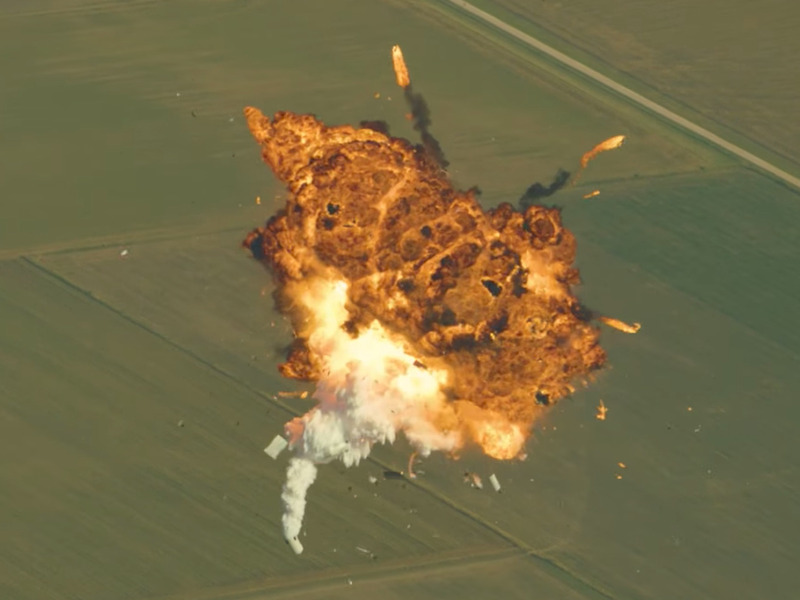 “A water-ditch landing is safer than an exploding rocket close to the ground,” he told Business Insider. But in this case, nothing that would be considered critical to NASA’s mission – only SpaceX’s convenience – seems to have gone wrong.